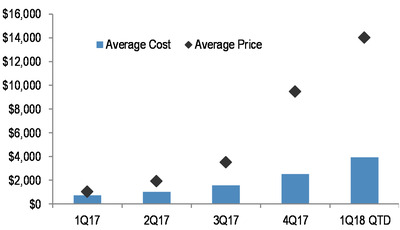 Bitcoin mining is becoming more expensive, according to JPMorgan. Bitcoin miners are in an arms race that is driving the cost of minting new bitcoin to all-time highs. That’s according to a big report on cryptocurrency out Friday by the financial giant JPMorgan. Miners are the folks who unleash new bitcoin into the universe by running computationally intensive algorithms on systems called rigs. The miners pumping out the most computing power – or “hash rate,” referring to how many cryptographic calculations the machines can do each second – have the best chance of earning a new bitcoin. As such, miners are building more and more rigs to one-up their competition. “The industry is currently in a hash rate arms race, as the current bitcoin price is incentivizing the addition of more and more mining capacity,” the report said. That doesn’t mean more bitcoins are being created. The cryptocurrency’s network is designed to increase the difficulty of successfully mining a coin as the total hash power increases to maintain a more or less steady rate of bitcoin creation. More hash power means higher energy costs. As such, the cost to mine one bitcoin has increased dramatically. “If this growth in hash rate continues (as it likely will if margins stay positive) without an offsetting increase in energy efficiency of miners, average costs globally will continue to rise,” the bank found. 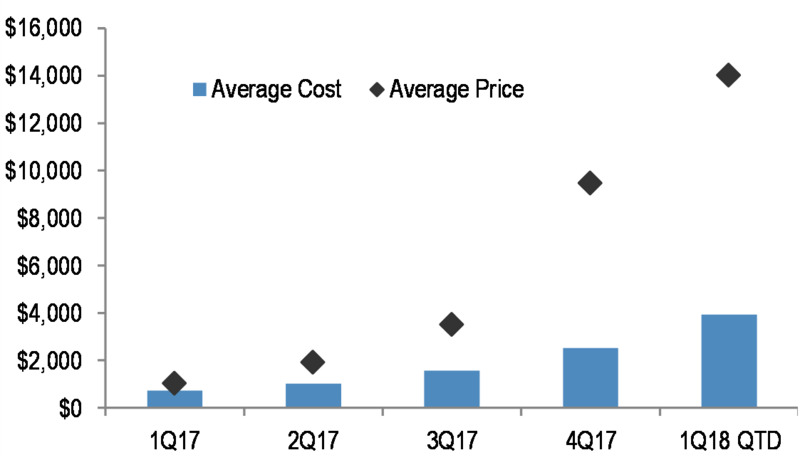 Already, the bank estimates the price of mining one bitcoin has jumped tenfold over the past year.